How big is a Peregrine? The Peregrine is the largest falcon in the U.K. The male is the size of a crow and is two-thirds the size of the female. The male is known as a Tiercel and the female simply as a Falcon. Do Peregrines pair for life? Peregrines do pair for life. However, if one of the pair dies the surviving bird will accept a new mate. The Peregrine is one of the world’s fastest birds. In level flight it flies between 40 and 50 m.p.h., but in a dive or stoop it has been recorded at just over 200 m.p.h. They prey on birds that they catch in flight. A Peregrine will fly above its intended victim then, folding back its wings, it stoops (dives) on it's prey, either grabbing it in flight or striking it dead on impact. Another hunting method is to perch high up and wait for a bird to pass below it. When the prey is a short distance away the Peregrine will leave its perch and rapidly close on its victim by approaching from behind and slightly below. Urban peregrines mainly prey on street pigeons but have been recorded taking a variety of species. Peregrines do not build nests but make a shallow bowl which they scratch out with their feet. Urban Peregrines do this in roof shingle, pigeon remains or other available debris. How many eggs do Peregrines lay? Peregrines lay a clutch that consists of 2 to 4 eggs. If the first clutch is lost the falcon will lay another if there is enough time left in the breeding season. How long does incubation last? Incubation starts with the laying of the penultimate or final egg: in other words the 3rd or 4th egg of a 4 egg clutch. It takes on average between 29 and 33 days for a single egg to hatch. The female does most of the incubation. The male will incubate the eggs after he has arrived at the nest site with food for her. Whilst the male incubates she will fly off with the food to eat it, afterwards she preens and relaxes. This is known as a nest relief. How long does it take the chicks to fledge? The chicks fledge between 38 and 44 days. A young bird that has just left the nest has fledged. When it is still in the area and flying it is known as a fledgling. They fledge from the nest site after fully acquiring their flight feathers. At this stage young Peregrines are very vulnerable. 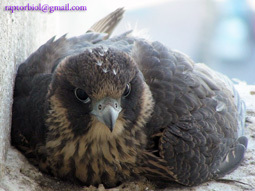 When the young Peregrines fledge in an urban environment the first 2 to 3 days can be especially dangerous for them. This is because the buildings they often nest on have sheer sides that have no intermediate perching places such as balconies or wide window ledges. Young Peregrines when fledging will fly for about 70 metres before they turn with the intention of returning to the nest site. However in the process of doing this they often lose height so that on their return they often glide into the windows or sheer sides of the building instead. At this point they will frantically attempt to gain a grip on any surface that might afford one. When these attempts fail the fledgling slides down the side of the building and can end up at ground level. Potentially they are now in great danger with the most serious threats coming from vehicles and animals. If the nest-site is monitored around fledging time then this problem can be minimised as the grounded falcons can be rescued and returned to the original roof. If for some reason this is not possible (for instance, when the access to the roof is close to the nest site and there is a risk of the remaining chicks being frightened off the nest ledge before they are ready to fledge) then the tallest roof nearest the nest site should be used. This rescue should be carried out by a Schedule 1 License holder or a suitably authorised individual. I've seen a recently fledged Peregrine lying down. Is it OK? Yes, young Peregrines like to lie down on flat surfaces. It isn’t injured it’s just relaxing. I've seen a Peregrine holding its foot (talons) up into its breast feathers. Is it injured? No, all birds of prey do this. They like to relax and “chill-out” by doing this. They will also change from foot to foot. It will take young Peregrines between 2 and 3 months to become independent and be able to hunt for themselves successfully. When they first leave the nest site their flying and landing skills are not very good. It usually takes about 3 days for each bird to learn how to use the wind and how to use its tail to brake and stall before landing. During this time they can fly into buildings (especially extensively glazed ones) because they haven’t learned how to stop. Sometimes birds get into difficulties and have to land at ground level. In an urban environment this usually necessitates the bird’s rescue. After 3 days of flying the fledglings (or juveniles) will play in the sky. 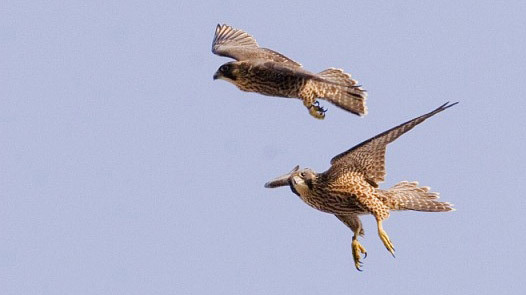 They talon grapple (where two birds will present their talons to each other) and chase each other in a game of tag. This play is essential for developing their hunting skills. Also at this time the adults will drop prey in mid-air for the juveniles to catch in a food pass. All these activities contribute to bringing about the day when the juveniles will become independent. The adults will continue to feed the juveniles until they disperse naturally. There is no evidence that the adults drive them away. How long do Peregrines live? If the Peregrine lives to become an adult their life expectancy is between 11 and 15 years on average. Of course there are exceptions. How many juveniles reach maturity? The mortality rate of juvenile Peregrines is high. Between 70% and 80% of all fledged youngsters will die in their first year. From a clutch of 4 eggs only one or two birds will make it to breeding age. At what age do Peregrines breed? They can breed from the age of two. How long does it take a Peregrine to get its adult plumage? When the young fledge they are camouflaged in a lovely warm brown and cream colour designed to match the rocky surroundings of their traditional nest sites. They moult into a beautiful blue/grey plumage, with a white breast that has blue barring, a distinctive dark blue hood and moustachial stripe. It takes 16 months from the time the bird fledges for it to acquire its adult plumage. The moult starts in April. What does the word Peregrine mean? Why have Peregrines come to town? Peregrines have come into cities and towns because there are plenty of tall buildings with suitable ledges to nest on and there is an abundant supply of their favourite food item, the feral/street pigeon. Where can I see Peregrines in London? If you have never seen a Peregrine before, or are uncertain about your ability to identify one then the best place to view Peregrines is at the Tate Modern during the summer school holidays. The RSPB usually have a free viewpoint here at which they provide telescopes to give members of the public close-up views of Peregrines. 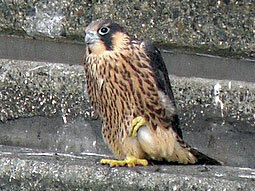 The Tate Modern from July through to February is probably the most reliable place to view Peregrines in London. If you are confident in your ability to identify Peregrines, and have binoculars, then there are some other locations in London where it is often possible to see Peregrines. These are in the areas around Battersea Power Station, Rainham Marshes and the WWT Wetland Centre, Barn Elms. At these sites you should scan the sky looking for Peregrines flying and also check any tall buildings for perched birds on high ledges. Peregrines don’t usually like sitting in the wind so check the sheltered sides of buildings especially carefully. Peregrine territories are large. If a bird is patrolling its territory or is ‘chilling’ (usually perched with one foot raised) on a tall structure that is out of your view then it is very possible to miss out on seeing them in a short visit. Early mornings or late afternoons/evenings usually provide the best chance for seeing the birds hunting, however nothing in nature is guaranteed. It is also possible to witness a hunt in the middle of the day, although the likelihood of this is greater in the breeding season. 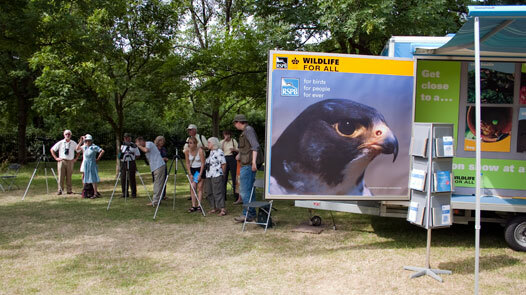 The London Peregrine Partnership is keen to encourage your enjoyment of Peregrines. People who live in, work in or visit London rarely have the opportunity to make such a direct connection with nature. The fact that the birds have chosen to bring up their families alongside us gives us all a wonderful opportunity to witness the charms and dramas of their daily lives. 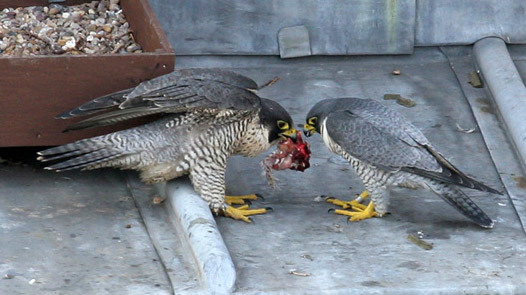 Before the Peregrine arrived in our cities this was something that few people had ever witnessed. When viewing Peregrines please remember that they are highly protected birds. Your enjoyment of the Peregrine therefore comes with the responsibility to ensure that the bird’s welfare should always come first. If you are in any doubt that your action might cause the Peregrine harm or disturbance then don’t do it. If you need further specific advice then email us at info@london-peregrine-partnership.org.uk. Finally we hope that your first encounter with these wonderful birds will not be your last and that like us you will come to appreciate the privilege of having them live alongside us. Ratcliffe, D. (1993). The Peregrine Falcon . 2nd ed. London: T. & A.D. Poyser. Treleaven, R. B. (1988). In Pursuit of the Peregrine . 1st ed. Wheathampstead: Tiercel. Treleaven, R. B. (1977). The Private Life of the Peregrine Falcon . 1st ed. Penzance: Headland Publications. White, C., Cade, T., Enderson, J. (2013). Peregrine Falcons of the World . 1st ed. Barcelona: Lynx Edicions. Sherrod, S. K. (1983). Behavior Of Fledgling Peregrines . 1st ed. Boise, Idaho: The Peregrine Fund. Cade, T. J., J. H. Enderson, and J. Linthicum (1996). Guide to management of Peregrine Falcons at the eyrie . Boise, Idaho: The Peregrine Fund. Sherrod, S. K., W. R. Heinrich, W. A. Burnham, J. H. Barclay, and T. J. Cade. 1987. 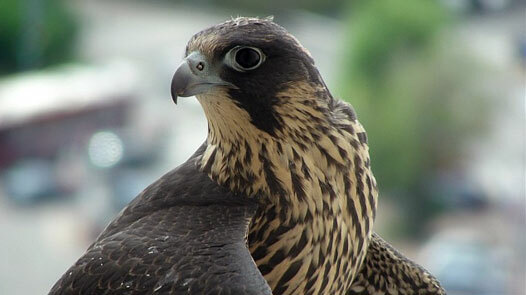 Hacking: a method for releasing Peregrine Falcons and other birds of prey . 3rd ed. Boise, Idaho: The Peregrine Fund. Frank, S. (1994). 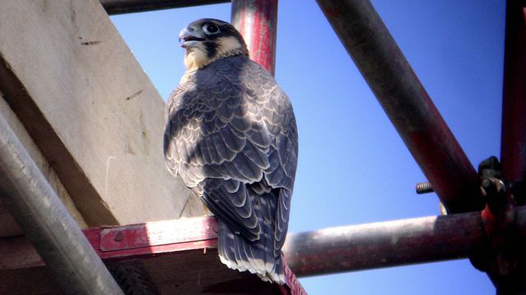 City Peregrines: A Ten-Year Saga of New York City Falcon . 1st ed. Surrey, B.C. : Hancock House. Drewitt, E. (2014). Urban Peregrines . 1st ed. Exeter: Pelagic Publishing. Macdonald, H. (1996). Falcon . 1st ed. London: Reaktion Books.